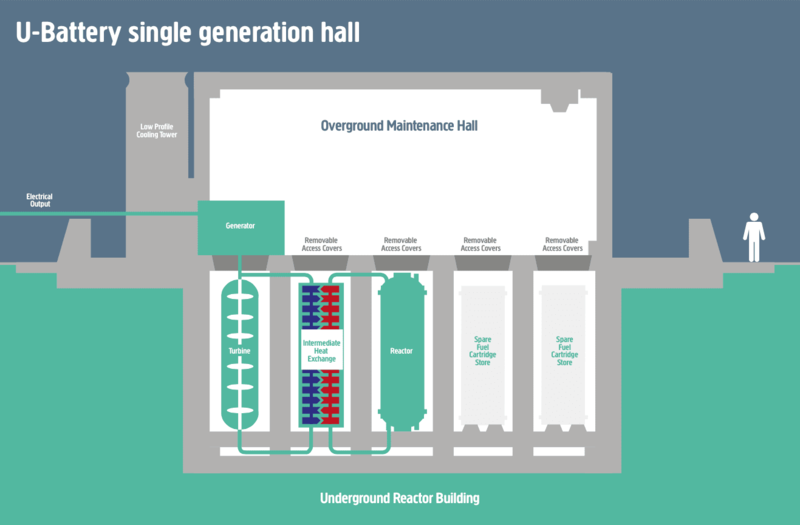 U-Battery is a ‘micro’ nuclear reactor which will be able to produce local power and heat for a range of energy needs, mainly targeting the markets for industrial power units and off-grid locations. Powered by Triso fuel, each helium gas-cooled unit produces 10 MWt, can deliver up to 4MWe as electricity and can provide 750 degrees Celsius of process heat. 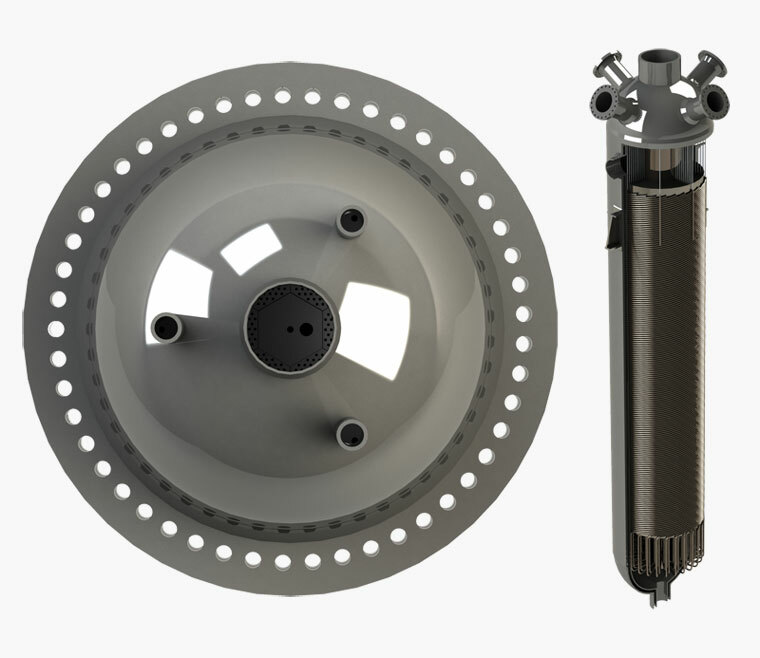 Triso fuel comprises spherical particles of uranium fuel with a triple carbon-coating which effectively gives each tiny particle its own primary containment system. Twin unit – each unit has an output of 4MW electric, 10MW thermal. Gas cooled – helium in primary circuit, nitrogen in secondary circuit (no water). TRISO fuel – high integrity. In combination with low absolute power and absence of water eliminates need for multiple back-up safety systems. Heat and power source – 710°C process heat. 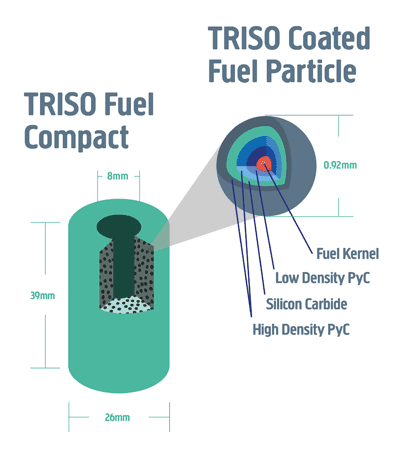 TRISO fuel is constructed by triple coating spherical particles of uranium fuel. A uranium centre is coated in a layer of carbon, which in turn is coated in silicon carbide, with a further outer layer of carbon. The structure and spherical shape of TRISO fuel means that it maintains its integrity under extreme conditions. Research has shown that even at temperatures of up to 1800°C (200°C hotter than assumed accident conditions) the majority of fission products remain inside the TRISO fuel particles, significantly enhancing safety. TRISO fuel is based on proven technology. It was originally developed in the 1980s and is currently being manufactured in the USA. Speaking at the UK Nuclear Industry Association’s conference on small modular reactors (SMRs) earlier this week, Threlfall said the Canadian market for U-Battery could be “very, very large”, with more than 300 locations, each of which could use between one and six batteries. 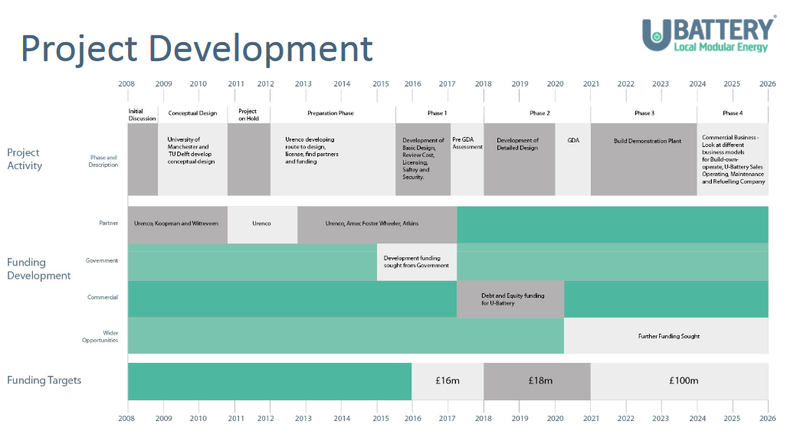 Threlfall said the consortium would be looking at when it could “get involved” in licensing in the UK. Triso fuel is already proven and is manufactured in the USA by BWXT, but Threlfall said most of the reactor’s components could be supplied from the UK. The CNSC’s pre-licensing vendor review process is an optional service to provide an assessment of a nuclear power plant design based on a vendor’s reactor technology. The three-phase review is not a required part of the licensing process for a new nuclear power plant, but aims to verify the acceptability of a design with respect to Canadian nuclear regulatory requirements and expectations. Last year, the Canadian regulator agreed to conduct a first-phase vendor design review for LeadCold Reactor Inc’s SEALER design concept and Terrestrial Energy’s integral molten salt reactor design concept. 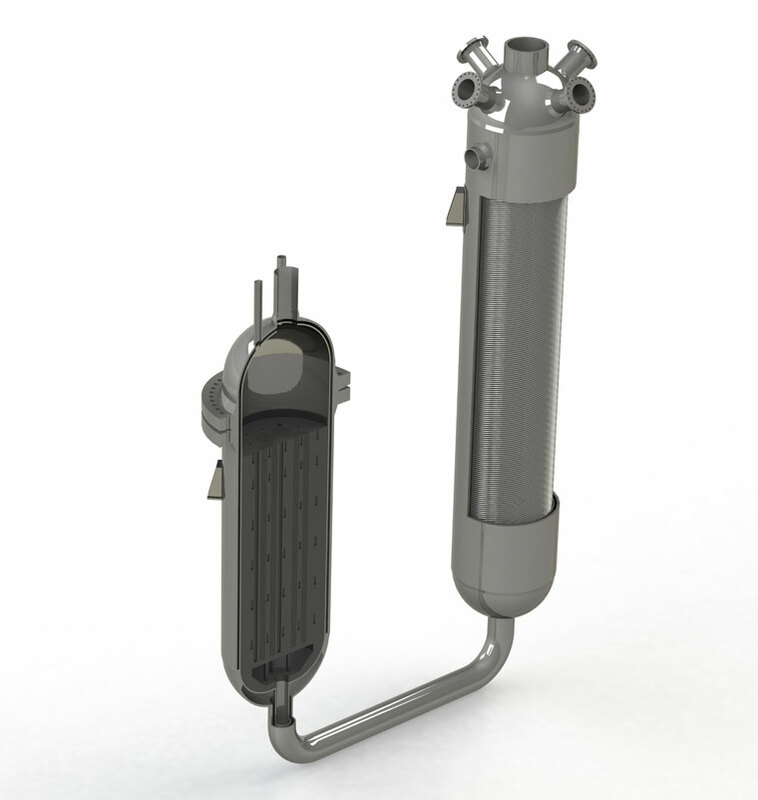 In addition, Canadian reactor designer StarCore Nuclear applied in November to begin the vendor design review process for its 20 MWe high temperature gas reactor, which like U-Battery uses Triso fuel.